Hey everyone! I have another Halloween mani to share with you today. This one features China Glaze Zombie Zest & Jindie Nails Screaming Halloween. Zombie Zest is from the 2010 Awakening Collection. This was a great collection of polish! It is a murky (yellow based) green jelly-ish base with tons of green (and gold?) glitter. It almost takes on a golden look next to the yellow Jindie Nails polish. Formula for Zombie Zest is excellent! I used 3 coats plus topcoat. It is perfectly smooth. This was my first time wearing this polish and I’m not sure what I was waiting for. I love it for this time of year! Jindie Nails Screaming Halloween is a LE polish from the October 2013 A Box Indied from llarowe. This is a sheer milky yellow base with green, orange and black glitter in various shapes and sizes including moons, stars and round. I layered 2 coats of this over a basecoat of a shimmery yellow polish called Impala Caja Mango. The glitter all came out pretty well, but did need to be placed and manipulated on the nail. The large glitter pieces made this one very bumpy even after one coat of quick dry topcoat, so I put a coat of Nail Pattern Boldness Glitter Food over it and that helped a lot. 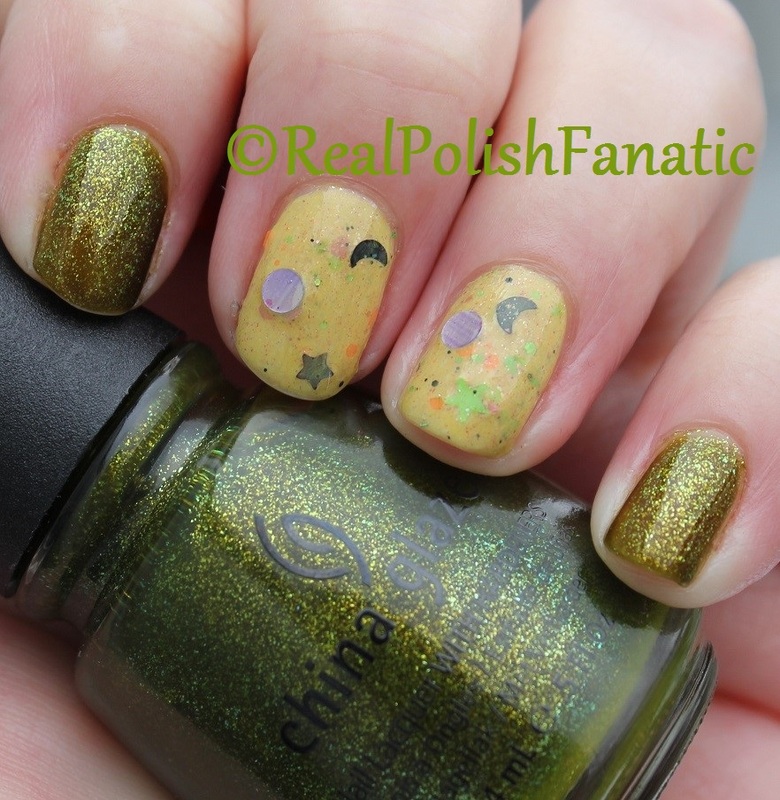 China Glaze Zombie Zest, 3 coats & Jindie Nails Screaming Halloween, 2 coats over 2 coats of a yellow polish base. I put this on 2 days ago and just took pictures today, so it is really holding up well! Well, there’s another mani in the books.